Even so, there were exceptions. 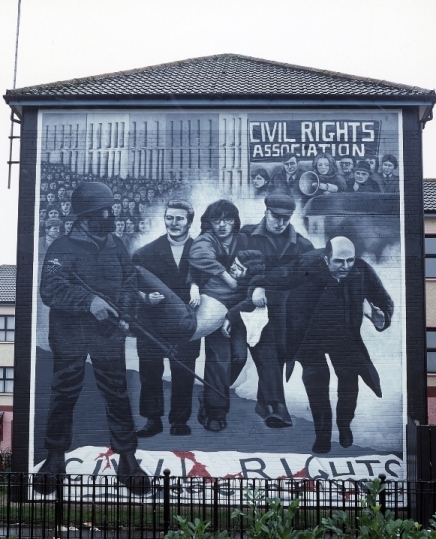 One example is a series of twelve murals called The People’s Gallery, the first of which was painted even before the end of ‘the Troubles’ – the violent thirty-year conflict that began on 5 October 1968 with a non-sectarian civil rights march in Derry/Londonderry, and concluded on 10 April 1998 with the Good Friday Peace Agreement in Belfast. The People’s Gallery can be found on Rossville Street in the Bogside area of Derry/Londonderry, a traditionally poor and neglected Catholic neighbourhood that had long suffered from discrimination against Catholics in housing, voting and jobs. They were painted between 1994 and 2006 by three local muralists – William Kelly, his brother Tom Kelly, and Kevin Hasson – known as the ‘Bogside Artists’ (William passed away in January 2017.) All three grew up in the area during the Troubles. Each lost family and friends. 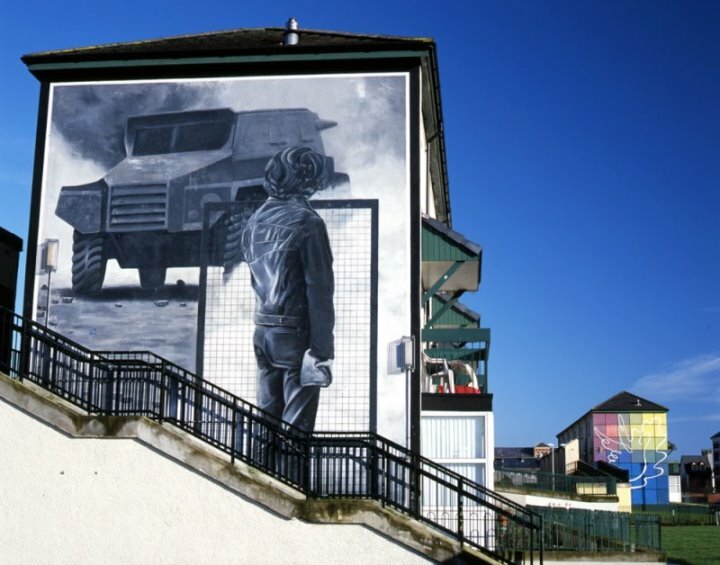 The murals depict key moments of the Troubles as they happened on their doorsteps. Although they are ‘political’ in the sense of depicting political events, they are not so in the sense of supporting or promoting a particular political or paramilitary agenda. The murals do not contain any slogans, symbols or other types of references to nationalist or Irish history, identity or mythology. The artists strongly reject the simplistic binary model with which Northern Ireland’s mural art is routinely associated and oppose the toxic identity politics that informs this way of thinking. As a grassroots, site-specific work of commemorative public art, the murals provide a natural talking point to process painful memories. This is especially important since, unlike South Africa, Northern Ireland never had – and never may have – a proper truth recovery and reconciliation process. Many politicians today want to re-brand Northern Ireland as a safe and inclusive post-conflict society that is economically viable and forward looking. For them the murals are unwelcome reminders of a past in which they were themselves often deeply implicated. Ordinary residents are urged to draw a line under the past and to ‘move on.’ In such a climate many victims are not only left without due justice, but also without any voice or means to remember the traumatic past in any meaningful way. For them The People’s Gallery serves as a commemorative public lament over painful or important incidents, as a way to work towards healing. 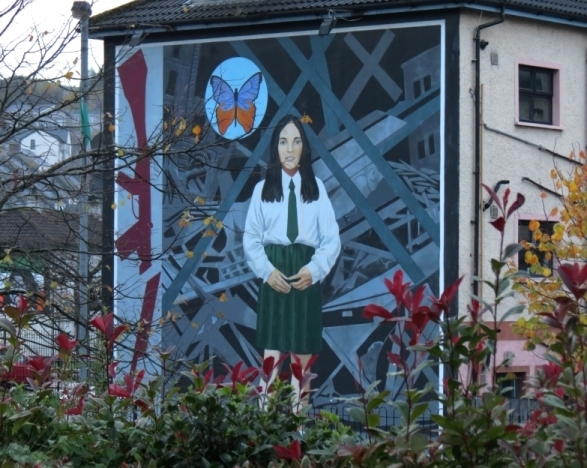 The mural Annette, for instance, subtitled Death of Innocence, marks the death of a 14-year old girl who was killed by a British bullet, fired from the city walls overlooking the Bogside, while walking home from school. She was a cousin of Kevin Hasson and the hundredth victim of the Troubles – as well as the first girl – at the time. The mural is just a few meters from where she died. 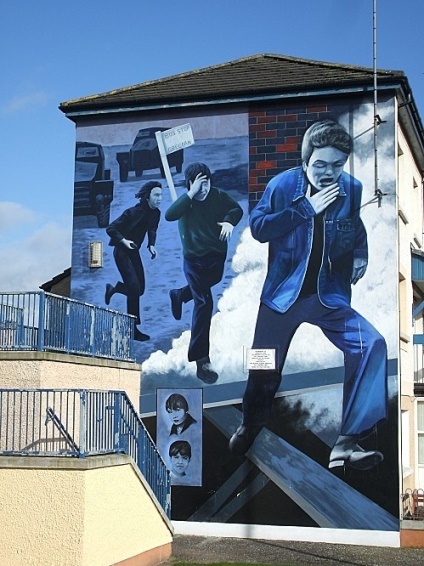 The mural ‘The Runner’ represents three other children, all aged 15, killed in the Bogside during the Troubles, each under very different circumstances. One of them was killed by the premature explosion of a petrol bomb he was about to throw at a British foot patrol. Another boy was killed by an IRA bomb while watching an Orange Order parade. And the third, a cousin and close friend of Tom Kelly, was, like Annette, killed by a British bullet fired from the city wall. The mural Bloody Sunday commemorates the fatal shooting of fourteen unarmed Civil Rights protestors by British Paratroopers on Sunday January 30, 1972. As a poignant reminder of the violence on the day, the wall on which the mural is painted still contains the bullet holes of the shots that were fired that day. When standing in front of the mural The Rioter one can see the Peace Mural in the distance, with a very different tone and colour. With its simple composition and explosion of bright colours, it offers a glimpse of hope and healing. The People’s Gallery shows how art can provide a safe space for remembering the past with hope in a society that has an official ‘peace agreement’ yet remains very far from being ‘post-conflict’. From 25 May until 30 June 2017 Coventry Cathedral, with its longstanding global ministry of peace and reconciliation, will host the exhibition Art, Conflict and Remembering: The Murals of the Bogside Artists. The opening is on 24 May from 7pm to 8.30pm. The exhibition will be accompanied by a 72-page catalogue 'Art, Conflict and Remembering: the Murals of the Bogside Artists', which is available for purchase at the exhibition or via http://www.amazon.co.uk. For more information go to: http://www.coventrycathedral.org.uk/wpsite/blog/2017/05/14/art-conflict-and-remembering-the-murals-of-the-bogside-artists/ and https://bogsideartists.wixsite.com/travellingexhibition. Adrienne Dengerink Chaplin is a Teaching Fellow in Religion, Philosophy and the Arts at King’s College London, UK. Originally from Amsterdam she previously taught at the Institute for Christian Studies in Toronto. She lives in Cambridge, UK.